Police in Dublin, investigating dissident republican activity, have arrested two men after surveillance equipment was found in a hotel room overlooking a garda station. It was discovered after a man known to gardai was seen in the hotel. It was believed the equipment was being used to record car registration plates and identify gardai involved in operations against dissident activity. Harcourt Street station is the city's Irish police regional headquarters. The BBC's Dublin correspondent Shane Harrison said garda (Irish police) sources had described the discovery of the equipment, including cameras, as "sinister". "The hotel room where the equipment was found overlooks a police block, which houses amongst other units, special branch and the Criminal Assets Bureau - the Republic's equivalent of the Assets Recovery Agency," he said. 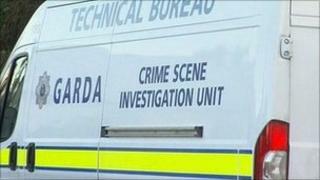 One of the men arrested was seen at the hotel in Harcourt Square on Wednesday. He was found to have booked a room under a false name. Police later arrested two men, aged 41 and 32, nearby, in the city's main shopping thoroughfare, Grafton Street. They are being held under Section 30 of the Republic's Offences Against the State Act for membership of an unlawful organisation and providing assistance to an unlawful organisation. The men can be held for up to three days before they are either charged or released.